I believe that running your own business is the best way to get the freedom and flexibility that you want; and I’ve already shared some general principles on how to set up your business so that you get to realise those benefits in practice. In the next few weeks, I want to continue on this topic and get into more concrete details as to what you need to do to make your business work for you. 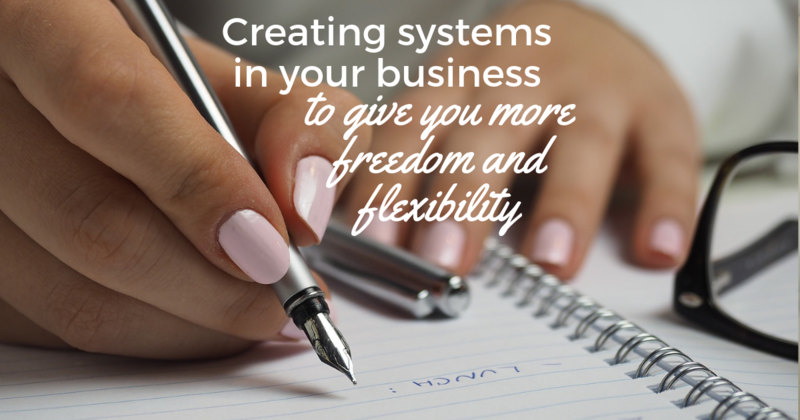 And, this week, we kick off with the exciting topic of creating systems in your business! What do I mean by ‘systems’? I’m using ‘systems’ in the sense of the principles and procedures by which you run your business, including processes, routines and tools. Large companies – like Procter & Gamble, where I spent the formative years of my career – are known for their processes and systems. As employees, we complain about them and long to be free to just do things rather than have to follow those rigid steps and procedures. When you first start out on your own, that’s a massive part of the appeal: you get to wake up every day and do exactly what you want, exactly how you want to do it. Hurrah! However, you will eventually find, as I did, that flying too freely is going to be completely inefficient. You have to reinvent the wheel each time you do something, you waste time umm-ing and ahh-ing over what to do and when, and you end up distracted from what really matters in your business. In large companies, systems build cohesion and improve productivity by standardising work flows and simplifying communication between different teams, saving time and energy and, ultimately helping to grow the business. While it may not seem necessary to have those systems in place in a small business, especially if that small business is just you as a solopreneur (at least for now), the overarching benefit of freeing up your time and energy to work on what really matters still applies. For example, documenting your work flows will help to capture how you need to do something next time (especially important when it’s something you don’t do very often, for example, your company accounts) and will allow you to delegate or outsource to someone else in due course. Setting up simple automated processes will mean that things are happening routinely without your having to get involved. And having your own routine that you follow each week will help ensure that you get straight to work each day on the most important priorities. Systems are especially suitable and valuable when it comes to tasks that are particularly manual and repetitive. You can start with some basic tasks and then get more sophisticated as you evolve. Here are just some of the systems that I’ve created in my own business and that you might go about implementing for yourself. I want to start with this one, even though you may not think of it as a system, and I can’t emphasise enough how important this one is, especiallywhen you’re alone in your business. Rather than waking up every day and making it up as you go along, you want to get super clear on what your priorities are and then use time blocking and careful planning to make sure that your calendar actually reflects those priorities. Tools: Check out my article on designing your ideal week. Once you’ve come across a problem or task, and you’ve found a solution, you want to capture that in a step-by-step process. Not only does this help you remember what you did next time you have to do the same thing, and add to that as you learn and optimise, but it also prepares you for when you’re ready to delegate and outsource to someone else (more on this next week!). Tools: I’ve been using Screenflowfor Mac to create videos of key processes and then I just keep them on Google Drive. Do you find yourself always answering the same questions from either prospects or existing clients? Instead of answering these individually, again and again, why not collect these in a set of Frequently Asked Questions (FAQs), write a blog post, or create an ‘evergreen’ resource such as a little pdf e-book or video. You can then direct future requests to that resource, offering people added value while saving yourself valuable time! Tools: I use Canvaor brief my favourite designer on Fiverrto create simple but attractive resources. One of the first systems I invested in when I got started was a scheduler. Rather than those endless emails back and forth – “I can do these dates and times,” “I can’t do those can you do this?” “No but I could do…” – this allows you to automatically sync your actual calendar so that clients can suggest one or more slots that work for both of you. You can set up reminders and notifications to make sure people turn up as well! Tools: There are plenty of these calendar apps available so have a think about what functionality you want, and then compare the solutions. I’ve been using ScheduleOncesince the beginning, recently rebranded as OnceHub. I’m a fan of organic posting and I don’t love it when I see people’s automated posts going out… That being said, you can’t always be available to post ‘live’, and at least for the basic, repetitive posts – or when you’re away on holiday, for example – it’s great if you can have those posts going out even when you’re not able to get to your computer. This helps you stay consistent and builds trust with your audience. Tools: At the moment, I’m using a combination of Buffer, the native Facebook scheduler, and then recently Planolyfor Instagram. Another one of my first software solutions when I started my business was email marketing software. This allows you to send automated email sequences, for example, when someone opts in to a free resource that you have available for download. In these sequences, you can share more about your own story, give them other resources that might be useful, invite them to your Facebook group, and so on. Tools: I’ve been using GetResponsesince the start, with a combination of ‘auto-responders’ and ‘automation’. Running your own business means checking your incomings and outgoings, sending invoices and chasing payments, filing accounts, and so on. There are lots of software solutions now, many designed specifically for freelancers or small businesses, that help you with all these steps – from pulling in all your transactions via an automated feed connected to your bank to providing invoice templates with automatic reminder emails. Tools: I must admit that I used Excel for a long time but I have finally become a convert to technology and I now use FreeAgent. Of course, these are just a handful of examples and there are many more possibilities. If you are further along in your business, then I’d love to hear more about what tools and systems you use. Comment below with your tips and recommendations! However, if you are right at the beginning and don’t have *any* of these systems, you might want to re-think how you’re running your business and look at which systems you can start to implement as soon as possible.